With official figures showing suicides in Australia hit a record high last year, a world-first research partnership has found that TV can be a force for good for men’s mental health. 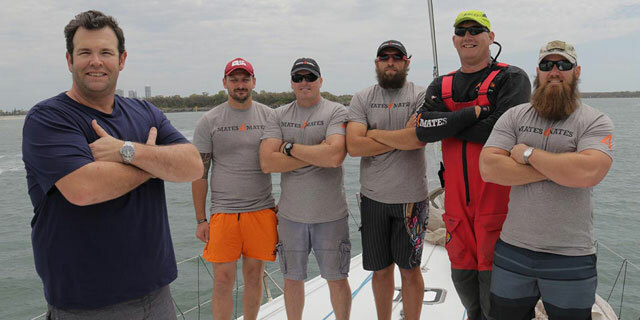 Man Up presenter Gus Worland sailing with former soldiers battling PTSD. University of Melbourne Professor Jane Pirkis led a team in designing a gold-standard evaluation of the documentary TV series Man Up, which premieres nationally on Tuesday 11 October at 8.30pm on ABC TV and iview, produced by Heiress Films. The evaluation involved 354 men, half of whom were randomly selected to view Man Up and half of whom saw an unrelated ‘control’ documentary on brain training. These men answered a range of questions before and after viewing their allocated documentary, and again a month later. Professor Pirkis said she wanted to see whether Man Up could shine a light on whether factors like self-reliance contribute to thoughts and behaviours that increase suicide risk. “We wanted to explore questions like, does being too stoic reduce the likelihood of a man talking to his mates about things that might be troubling him? 95% said they had a greater understanding of male suicide in Australia. Those who viewed Man Up were 34% more likely to seek help from a telephone helpline if they were facing troubling times, and 8% more likely to recommend that a male friend do so. There were no equivalent changes for those who viewed the brain-training documentary. Professor Pirkis, a renowned researcher on suicide and men’s mental health, said the randomised controlled trial proved that visual storytelling and giving men a safe, guided space to reflect had made a huge impact on the men who took part. “The media has, not surprisingly, taken a lot of flak over the years for reinforcing stereotypes about men and women,” Professor Pirkis said. “We have shown that TV can be harnessed as a powerful tool in promoting good mental health and preventing suicide,” she said. The three-part series, funded by global men’s health charity the Movember Foundation, aims to challenge the taboos around male mental health and the way these are shaped by expectations associated with masculinity. “Women need to see this side of men”; and “I had no idea there were so many people out there who can help”. Professor Pirkis also leads Ten to Men, the most significant longitudinal study of Australian men, with 16,000 participants aged 10-55. This article first appeared in the Melbourne Newsroom on 8 October 2016. View the original article.